Per non dimenticare lingue faticosamente apprese. Il programma prevede altri blogs per tedesco, spagnolo, francese, latino, greco antico. La lingua di partenza è l'italiano. L'approdo previsto è la linguistica e la filosofia del linguaggio. Ogni collaborazione è gradita. Libero adattamento per finalità autodidattiche di testi e registrazioni di pubblico dominio tratti da Librivox. Acoustical liberation of books in the public domain. Testo tratto da Progetto Gutenberg e registrazione da Librivox.org Serie: Short Science Fiction Collection 001-1. - Nostra numerazione del Brano: 1. 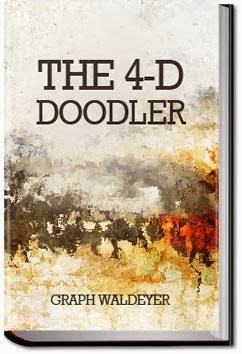 Reader: Elanor / download di “The 4-D Doodler” (1). Etext: Progetto Gutenberg/Waldeyer - Dizionari: Dicios; Sansoni:. "Do you believe, Professor Gault, that this four dimensional plane contains life--intelligent life?" At the question, Gault laughed shortly. "You have been reading pseudo-science, Dr. Pillbot," he twitted. "I realize that as a psychiatrist, you are interested in minds, in living beings, rather than in dimensional planes. But I fear you will find no minds to study in the fourth dimension. There aren't any there!" "Your proof," Dr. Pillbot broke into his thoughts insistently, "is purely negative, Professor! How can you know there are no beings in the fourth dimension, unless you actually enter this realm, to see for yourself?" way, into the dimension of thickness an obvious impossibility. Similarly, we can not enter the fourth dimension. Do you see?" are not two dimensional shadows, and--why, what is the matter?" psychiatrist wheeled around, followed his host's gaze. motions. Harper himself seemed in a trance. reappeared. Once again the phenomenon happened. "Harper!" Gault's voice was like the snapping of a steel trap. apologetic murmur floated from his desk. "What was he doing?" Pillbot asked puzzledly. "Doodling!" Gault spat out the word disgustedly. designs people make while their attention is elsewhere occupied. For one of his retiring temperament, Harper was aiming high. by skyscrapers as they were built up toward the 150 story mark. as though it were something the cat brought in. Gault over to the futuristic statuary. As Gault made strangled noises, Pillbot stared interestedly. geometric solids!" rasped Gault. He wheeled upon Harper. laboratory. Throw it into the hall for the janitor!" "It--it won't budge," he exclaimed amazedly. "Eh? Won't move? It's not heavy, is it?" demanded the Professor. "No--about thirty pounds, but it wont move!" in tangential stress. What had happened to that top section? "I shall take this matter before the Psychiatric Society,"
exist!" Gault's voice was tinged with sarcasm. on the surface of Harper's desk. never see four dimensional beings?" prevent them from seeing us_?" followed his glance--and saw it. Professor Gault had vanished from the waist up. been sheared away, neatly and precisely, at the waist. Harper and back again, sweat splashing from his puffy face. midst of my sentence. I--I trust you will--ah, return at once!" understanding, his eyes became glazed and he backed away. to feel their way, like a blind man, about the floor. Harper stared wildly, white showing around his pale blue irises. dimension!" Harper moaned faintly, wringing his hands. glanced fearfully at the half-figure. by some Being of the fourth dimension?" back to the desk. The other orange had vanished. examined it. He looked up wide-eyed at Pillbot. slowly replacing his former fright. He snapped his fingers. "Imitation again!" he said, half to himself. He looked at Harper. inside out orange flew out of his grasp. sight of the two startled men. hand extended tremblingly toward the inverted orange. "What's the matter?" cried Pillbot. hands slowly came up to clutch at his stomach. Harper looked quickly at the desk top. "The other orange," he gasped. "It's gone!" stuff inside of me," he yammered. along in the vicinity of the paper cutout. did would be imitated in a manner that might prove tragic. back with a muffled yell. the laboratory. Now press down the rest of the body." rapidly, but no words came. torso of which still bulged upward from the desk. Harper drew back his hand as if he had touched a red hot poker. sheer through a large stiff piece of paper. A moment later he looked up as Pillbot walked over. "Gault has some reason for not wanting his silhouette touched,"
wants time to figure out--why, what are you doing?" this one doesn't look like the Professor, isn't tall and thin. bench, held it suspended before him. psychiatrist had stood was now nothing, not even a half man. of Pillbot flash back. He did not know what to do with it. chandelier, where it dangled swaying in the slight air currents. to act in a certain way, without knowing why. man's head. The head was watching him, the expression savage. form, would be testing It too far. He, Harper would take the place of his own cutout! moment he lay there, in "Flatland"--then leaped to his feet. cellophane. They bore a strange resemblance to his "doodlings,"
consisted of joined and meshed space-warps. there above him. And the solidity was in motion. and was even now observing him with its four dimensional sight! Form just beyond his comprehension. Harper hardly noticed that Pillbot was beside him, shaking him. skyscrapers encountered the "stress-barrier" at a certain height. ear. "It is about to act. Became active the moment you got here. How did you induce it to bring you here?" explained quickly how he had induced the Being to act on himself. which they stood. A violent shake sprawled them on the "ground"
apparently hovering above the surface. Harper looked up in surprise. "Does it know about Napoleon?" Rising, Harper put away his pad. His calculations were complete. advantage of space stress instead of trying to fight the stress. caused it to be warped into the fourth dimension! crazy juxtapositions, now descending rapidly toward them. were visible. Then that too vanished. of sight the Form seemed to smash down on him. the base of the statue, on the laboratory floor. must get Gault back in some way, then leave the laboratory." mouth opened in a soundless shout of opposition. Harper hesitated. "Never mind him," yammered Pillbot. "Press the figure flat!" wall--but it was his complete figure. appease It--we must get out of here--"
Even as he spoke there was a thunderous crackling and roaring. simultaneously in several directions by powerful electro magnets. he felt himself knocked breathless against a wall. He picked himself up, looked around. On one side of him was the familiar south wall of the laboratory. to one side of the desk. frenziedly hugging the flooring under them. Harper crawled over, looked over the edge, quickly backed away. Several hundred feet below, the traffic of the city roared! stepped back quickly, his face pale. the creature will precipitate us into the street!" he was contradicting his formerly held opinion. stalked up to the cringing Harper, thrust his face toward him. of a piece of paper?" "I--I don't understand," murmured Harper. "That paper doll was creased, wasn't it?" shouted Gault. case of that paper cutout. Into the fourth dimension in my case! dimension! Surely you aren't blind?" "Gentlemen," cried Pillbot. "The entity--we must get away. Another spasm will surely follow--"
locate this particular area of the third dimension again. some four dimensional Being--not with Judith to think about! 9. Short Ghost and Horror Story Coll. 12. Children’s Short Works C.
CSWC: Children’s Short Worls C.
SGHC: Ghost and Horror Story Coll. SSFC: Short Science Fiction Coll. 1. Exeter University. Gilad Atzmon: The Andering who, and where? 01. “Exploding Middle East Myths” written by Greg Felton. 02. Gilad Atzmon challenges picketers prior to his talk in Exeter University. 03. Nigel Farage: Governi Fantoccio per Grecia e Italia. 05. Alan Hart and Gilad Atzmon discussing Jewish Security Matters. BKJV/28/NT01-28. § 28: Matthew Chapter 28. BKJV/27/NT01-27. § 27: Matthew Chapter 27. BKJV/26/NT01-26. § 26: Matthew Chapter 26. BKJV/25/NT01-25. § 25: Matthew Chapter 25. BKJV/24/NT01-24. § 24: Matthew Chapter 24. BKJV/23/NT01-23. § 23: Matthew Chapter 23. BKJV/22/NT01-22. § 22: Matthew Chapter 22. BKJV/21/NT01-21. § 21: Matthew Chapter 21. BKJV/20/NT01-20. § 20: Matthew Chapter 20. BKJV/19/NT01-19. § 19: Matthew Chapter 19. BKJV/18/NT01-18. § 18: Matthew Chapter 18. BKJV/17/NT01-17. § 17: Matthew Chapter 17. BKJV/16/NT01-16. § 16: Matthew Chapter 16. BKJV/15/NT01-15. § 15: Matthew Chapter 15. BKJV/14/NT01-14. § 14: Matthew Chapter 14. BKJV/13/NT01-13. § 13: Matthew Chapter 13. BKJV/12/NT01-12. § 12: Matthew Chapter 12. BKJV/11/NT01-11. § 11: Matthew Chapter 11. BKJV/10/NT01-10. § 10: Matthew Chapter 10. BKJV/9/NT01-9. § 9. Matthew Chapter 9. BKJV/8/NT01-8. § 8. Matthew Chapter 8. BKJV/7/NT01-7. § 7. Matthew Chapter 7. BKJV/6/NT01-6. § 6. Matthew Chapter 6. BKJV/5/NT01-5. § 5. Matthew Chapter 5. BKJV/4/NT01-4. § 4. Matthew Chapter 4. BKJV/8/OT01-03/04. § 8: Genesis 19-23. BKJV/7/OT01-03/03. § 7: Genesis 13-18. BKJV/6/OT01-03/02. § 6: Genesis 7-12. BKJV/5/OT01-03/01. § 5: Genesis 1-6. BKJV/4/Pr.-03. § 4: Preface Section 3. BKJV/3/Pr.-02. § 3. Preface Section 2. BKJV/2/Pr.-01. § 2. Preface Section 1. BKJV/3/NT01-3. § 3. Matthew Chapter 3. BKJV/2/NT01-2. § 2. Matthew Chapter 2. BKJV/1/NT01-1. § 1. Matthew Chapter 1. CSWC/1/001-1. Unknown: “Beauty and the Beast”. Una parola al giorno: Homepage.